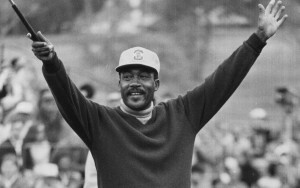 The World Golf Hall of Fame is preparing for African American History Month by inviting everyone to see “Honoring the Legacy: A Tribute to African Americans in Golf”. The permanent exhibition contains rare photographs, audio, video and memorabilia to highlight the long, rich history of African Americans in golf from the game’s pioneers in the late 1800s to today’s superstars. Visitors will see items that highlight the accomplishments of African Americans in the game despite facing steep challenges. This includes Hall of Fame member Charlie Sifford’s PGA Player Card from 1960, the document that officially broke golf’s color barrier. See other items marking the career of 1985 PLAYERS champion Calvin Peete and tennis great Althea Gibson, who was the first African American to join the LPGA Tour in 1964. Interactive, touch-screen video displays make this one of the Hall of Fame’s most advanced exhibits. Screens show profiles of prominent African American players. The exhibit launched in 2014 and continues to provide insights into the many contributions of African American players to the game of golf.